Because I can't listen to a podcast, read a magazine, or peruse a favorite blog without seeing tabbouleh or hearing about Yotam Ottolenghi, I bought some bulgur and parsley with the intention of making his tabbouleh recipe. I love that stuff--it's so refreshing and has such a unique mouthfeel and taste. I don't have it often but always enjoy it. My plans derailed, not for any reason in particular, but mostly because I had feta cheese that was beginning to take a turn and two peaches that were still as hard as rocks even after another week of ripening on the counter. I thought of this wonderful couscous salad (which I actually haven't made since that post went up nearly five years ago and I have no idea why it popped into my head now), and decided to tweak it a bit using bulgur. You guys, this is really good. The chickpeas offer such a toothsome bite that you know when you've got one in your mouth, but everything else kind of melds together until the sweetness of the peaches hits you or you crunch down on an almond or you detect the footiness saltiness of the feta. Herbaceous, bright, and so full of flavor, I may eschew real tabbouleh altogether and just make this dish a part of the regular rotation! Place the bulgur in a large bowl, pour in the boiling water, and add the lemon juice, olive oil, and 1-1/2 teaspoons salt. Stir, then allow to stand at room temperature for about 1 hour, stirring occasionally. Add the mint, parsley, chickpeas, peaches, cucumber, tomatoes, feta, almonds, remaining salt, and pepper; mix well. Season to taste, and serve or cover and refrigerate. The flavor will improve after several hours in the fridge. This looks really interesting! I love the taste of chickpeas, so I definitely should give this a shot - sounds like a great combo of flavors. Never tried bulgur wheat before! Bulgur is delicious and versatile. Lovely tabbouleh. never had bulgur before, tempting to try!!! I'm annoyed with myself now - I just ate a couple of peaches just because they were there. They would have been so much better like this! I've got all the other bits in, too. Omg, this is so weird. For the first time in many months I had (almost) the same thing for supper. I used semolina (realize it's not quite the same) but the rest of the ingredients, minus the the peaches, were the same...... and I loved it. Left overs for lunch! I'm going to have to try this one. Looks delicious!! I see Bulgur on the shelf at the grocery store, and tell myself I should try it, and I never do. I think I should change that, this sounds delicious! I love this type of salad and that feta cheese definitely arose my appetite! I haven't made or had a bulgur salad in a while. This looks like an easy, but a great one! This sounds even better than tabbouleh, if you ask me! Love that you added fruits to the mix! W-O-W! This is quite an inventive departure from traditional tabbouleh! Love your creativity! I think you would perform well on 'Chopped.' They should have a Food Bloggers edition. I would root for you! This sounds like perfect summer food! I'd love to have a bowl of this in the fridge to scoop from for lunch every day. Great idea! This looks like the perfect summer side dish. YUM. I bought a package of bulgar two weeks ago because it sounded healthy, and it's been sitting in the cabinet this entire time, waiting for me to figure out what to do with it! You're a hero! OMG! I totally crave this dish! 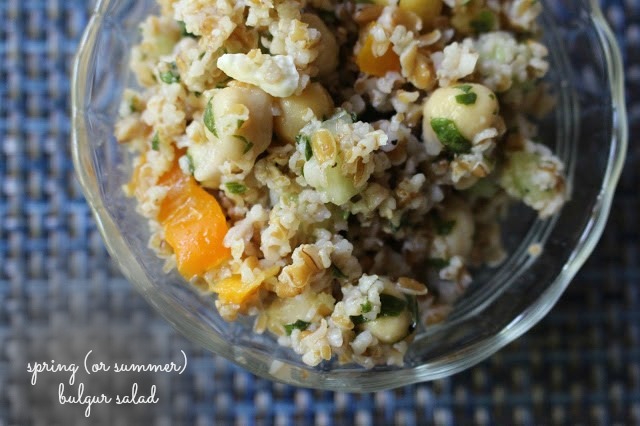 Such a wonderful bulgur salad!